The sequel to RENEGADES will be hitting bookstores this November, and I am finally allowed to call it something other than “Renegades 2!” That’s right, it has an official TITLE! EEEEEH, I AM SO EXCITED!!!! 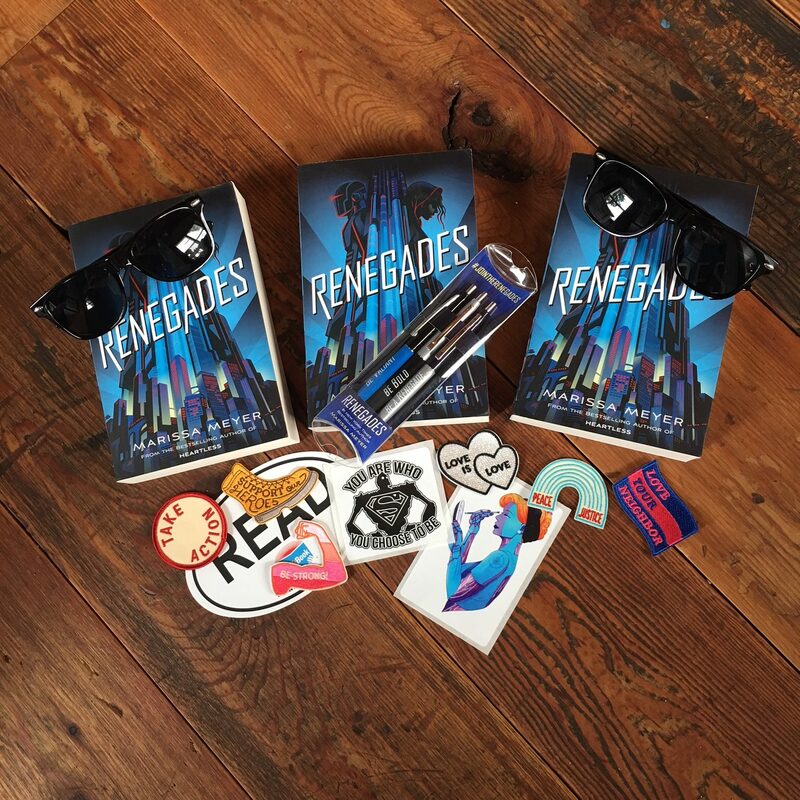 To celebrate… let’s have a Renegades-themed giveaway! – Three (3) winners will each received a signed copy of RENEGADES (international paperback edition) and assorted superhero-themed swag. – Closes to entries midnight PST on Wednesday, March 7. – Winners will be randomly selected and notified on March 8. To win, enter via the Rafflecopter form below. Good luck! Note: If you are reading this on Goodreads and can’t see the Rafflecopter form, head to my web site here. i have been waiter for ever it feels like STARS!!! AH!! You’re one of my all-time favorite authors, and this is the first giveaway I made it in time for lol! So exited my birthday is on Friday so if I win it will be like the BEST birthday present! 😉 Thanks again Marissa! The only book I don’t own by Marissa Meyer! I am so so so so so so so excited!!!!!!!!!!!! Have the winners been sent emails yet? Are you going to release the names like you did with your birthday giveaway? When are the emails/names coming??! The emails, I mean. Or even just the names on your website! This has got me on the edge of my seat!! Me too Leli! I WANT TO KNOW!!!!! Mabye someone on Twitter, Facebook, or Instagram can Tweet/Post about it??? OMG I feel like I lost!!! But I am SUPER excited to find out! SAME!!!!! I think I’m going crazy not knowing!!! GOING CRAZY AT MY HOUSE!!!! SO EXITED BUT I NEED TO KNOW MY FRIEND AND I ARE SOOOOOOOO EXITED TO FIND OUT BUT I NEED TO KNOW!! Do ALL the winners get Renegades pens? I think so! I also lost the other giveaway Leli. Renegades is the only book I don’t currently own by Marissa Meyer! I think I might DIE! It’s too late! I’ve already died. The suspense has killed me! Oh my stars this is so stressful! AAAAHHHH I 100% NEED TO KNOW RIGHT NOW!!!!!!!!!!!!!!!! Come on, Marissa!!! We’re all waiting!!!!!!!!!!!! THE SUSPENSE HAS KILLED ME. But then, you know, I was revived because I NEED TO LIVE SO I CAN FIND OUT. Cmon Mrs. Meyer are you doing this on purpose?!?! Are you doing this on purpose Marissa?????! I feel like a stalker lol. Like I’m checking the blog the way a girl would stalk her ex. This Tweet was posted 20 minutes ago so she is still on her computer but NOT HELPING US OUT! Love you Marissa but I NEED TO KNOW! I’m. Gonna. Go. Crazy. Selene is AWSOME I’ve been reading your comments and I’m feeling the same stress as you. I check every day but the winners aren’t up. WHYYYY??? I know, this is crazy!! Maybe we should send her a message on Insta or something?? I’m desperate I NEED TO KNOW SO BADLY!!!! Maybe SOMEONE can comment on one of her recent posts? I volunteer as tribute!!! Let’s see what happens guys!! Thanks Leli! She is on a book tour March 13-31 I just found out so I hope she will answer soon! I really really really really really really really hope she does!!!! It’s driving me 100% crazy not knowing!! AAAAAAHHHHH WHHHYYYYYYYY??????????? If I have to wait until the 31st, I. Will. Not. Survive. Ok so I sent her the DM yesterday but she hasn’t responded. I assume she’s super busy or something. Maybe that’s why she hasn’t posted the winners? Because she’s super busy? I hope that’s the case and she didn’t forget about the giveaway. Talking with a helper/assistant of Marissa Meyer and I hope she can help! Thanks Leli and Selene is AWESOME. Even if I didn’t win, I want to know who did!!! HELP MARISSA!!!!!!!!!! Same Ariadne! Selene is AWESOME did u get anything from the assistant? I’m super curious and this is killing me!! Did you get a reply Leli? HELP US MARISSA!! PLEASE! OR YOU COULD LOSE HALF YOUR FANS TO STRESS/DEATH! I feel like no one cares as much as the people who have been commenting do lol. We just mega fans ig!! Leli I KNOW RIGHT!!! We are the super fans. Nope nothing! Idk why she hasn’t responded!!!! Maybe she’s actually forgotten or something. Selene did you at anything from the assistant?? Nothing yet but she is on a book tour……..
Yeah…maybe she’s just busy with the tour and will post the winners when she gets home…….? She’d better post the winners sometime… as much as I’d prefer for it to be not after she gets back from her tour, seeing as that’s SOOOOOOOO LONG, as long as she posts it, I’m happy. SHE’D BETTER POST IT. Nothing! What about you Leli? Still nothing. She hasn’t even opened the DM!!! Does she have any idea how much this is stressin us out?!?! SAME Leli and Selene is AWESOME!!! I am slowly dying… AAAAAAHHHHHH!!!!! Please help us escape from this abyss of not knowing who the winners are!!! Selene is AWESOME did you call the assistant or was it like an email or something?? Email I emailed her again so maybe we can get a reply soon! NO STILL NOTHING!! I THINK SHE THOUGHT OUT THIS PLAN TO MAKE HER FANS DIE OF TOO MUCH EXPOSURE TO ANXIETY AND NERVOUSNESS!!! If that’s the case, her plan is definitely working!! Guess what guys I got in contact with MARISSA!!! Waiting for a reply but she is messaging me so YAY! I will keep you Lunartics posted! Hi guys….. Marissa didn’t reply 🙁 But I messaged her and her assistants several times so reply soon?! 🙂 May the force be with us! Got a reply!!! They say they will look into it! HALLELUJAH our prayers have been answered!! The winners have been chosen and the prizes sent. Stay tuned to Marissa’s blog and newsletter as I’m sure Marissa will have more contests down the road. That’s depressing… 🙁 Oh well! Better Luck Next Time! Good Try!!!!!!!! Yep! I hope she does one soon! At least we have the satisfaction of knowing who the winners were. I asked them to next time put the names on the website! ARCH ENEMIES coming in November 8th???!! My friend has the same birthday!